What It Takes To Become a Market Leader? 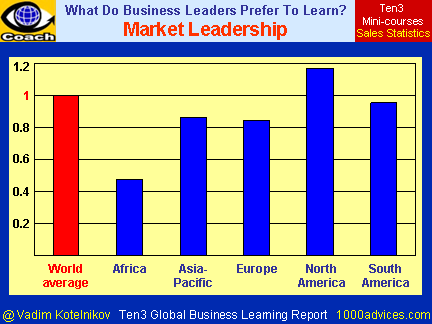 The market leader is dominant in its industry and has substantial market share. If you want to lead the market, you must be the industry leader in developing new business models and new products or services. You must be on the cutting edge of new technologies and innovative business processes. Your customer value proposition must offer a superior solution to a customers' problem, and your product must be well differentiated. And you should move faster than your competition! To be successful today, your company must become competitor-oriented. You must pursue the right competitive strategy – avoid strengths of your competitors and look for weak points in their positions and then launch marketing attacks against those weak points. 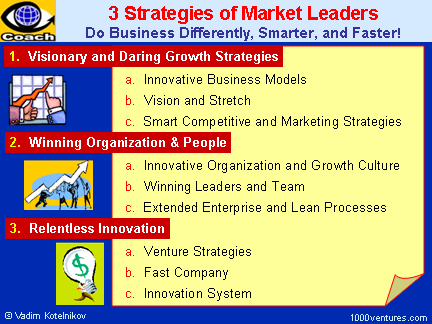 Sustainable competitive advantage is the prolonged benefit of implementing some unique value-creating strategy based on unique synergistic combination of internal organizational resources and capabilities that cannot be replicated by competitors. Sustainable competitive advantage allows the maintenance and improvement of your enterprise's competitive position in the market. It is an advantage that enables your business to survive against its competition over a long period of time. Do you want to encourage extraordinary performance from your people? Do you want them to do great things? If yes, then you must create an inspiring corporate culture to inspire and energize them. Establishing an attitude of relentless growth is what enables an organization and its people to achieve their goals. The spirit of relentless growth keeps fresh ideas flowing and reinvigorates your company. The Relentless Growth Attitude establishes a context within which corporate executives lead by setting direction, creating strategy, securing resources, defining organization architecture , and ensuring that learning occurs. The Growth Attitude should start at the top and work its way down your organization. The most successful companies are those that have developed aggressive venture strategies and have made ventures critical components of their strategic and operating success. In ventures, large and midsized companies can discover a source of growth they are striving to achieve. New business creation has become central to achieving strategic and financial objectives of market champions.